On March 11th, miles beneath the Pacific Ocean floor off the shore of North-Eastern Honshu (the largest of the Japanese Isles), the tectonic plates which meet there shifted, suddenly and dramatically. This movement sent a geological shock wave through the region, resulting in one of the most powerfull earthquakes EVER recorded, and in a devastiting tsunami, as well. More than a week has passed since that fateful day, and still the earth has not settled into a comfortable position. That means that there have been aftershocks of varying degrees of force several times everyday. We have grown so accustomed to them by now, that we dont give a second thought to the slight tremors. We have even grown numb to the larger shocks, many of which, if it were before March 11th would have been considered big earthquakes in their own right. Whether they are frightening or not, these aftershocks can have a disrupting effect on some: dizziness- something very much like seasickness. In fact, I was a victim of this phenomenon today, just after a hardly noticeable tremor ( I guess the building I was in must have been swaying alot). I felt like I would lose my balance, and maybe even throw up. When I told my friend about my sudden symptoms, she told me how to get rid of the feeling using self applied ACUPRESSURE and a special ( yet simple) form of breathing. Since it worked for me right away, I thought I should share the technique with you- since there are probably many more aftershocks in store for us in the near future. Use the index fingers of both hands to press at the base of your skull. 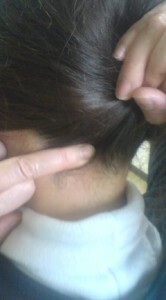 This is an important pressure point ( tsubo) in oriental medicine called the BON NO KUBO in Japanese ( see photo above for exact location). While applying firm pressure, breathe in through your nose for a five second count. Then, breathe out your mouth while you count to ten. It should do the trick! So even though the ground beneath our feet has still not settled down- you can keep your head from spinning using this simple, natural, and very effective technique.